Fyodor Zakharovich Zakharov (Russian: Фёдор Захарович Захаров; Ukrainian: Федір Захарович Захаров; September 5, 1919 – September 29, 1994) was a Russian and Ukrainian painter. He was awarded the title People's Artist of Ukraine in 1978, and in 1987 he was awarded the Shevchenko National Prize, the highest Ukrainian award for art and literature. Zakharov was born on September 5, 1919 in Aleksandrovskoye rural settlement, a little village in the Smolensk Governorate of the Russian Empire (today part of Monastyrshchinsky District, Smolensk Oblast). He descended from a farming family. In 1935 he received a grant to study at the Kalinin Academy of Art in Moscow, where he finished his studies with distinction in 1941. Health problems kept Zakharov from being drafted for military service. He continued his art studies at the Surikov Academy of Art in Moscow. Zakharov was taught as an elite student by Aristarkh V. Lentulov, one of the best known representatives of the Russian avant garde. 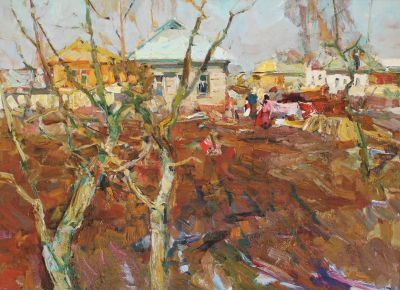 Zakharov started his career as an independent artist in 1950. This was the era of the totalitarian Soviet art, during which artistic expression was subordinated entirely to the interests of the Communist Party. Zakharov never created the so-called thematic paintings, which typically idealized the supposedly blissful existence of the Soviet citizenry. The young painter did not choose this path, which would have conformed to the ruling ideological system and would have guaranteed fast recognition and material advantages. Zakharov's art was inspired by the magnificent achievements of the Russian and Ukrainian landscape paintings of the late 19th and early 20th century, which are characterised by the poetisation of nature. Zakharov's landscapes and still lifes were highly admired. The paintings were exhibited in numerous art galleries and reputable museums in Kiev, Moscow and Saint Petersburg. He was awarded the title National Artist of the Ukraine in 1978 and in 1987 the Shevchenko National Prize, the highest award in art and literature of Ukraine. 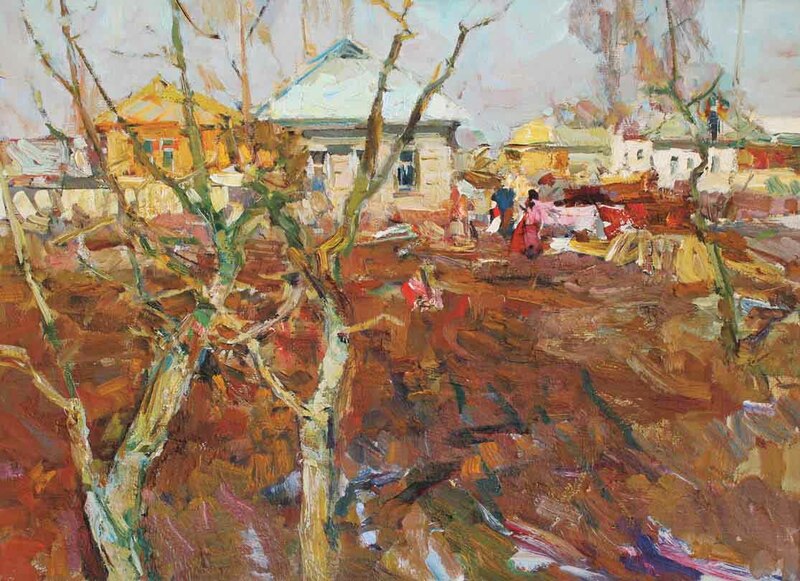 Zakharov's paintings are greatly valued by collectors in Russia, Ukraine and Western Europe. Zakharov was particularly attracted to two landscapes. 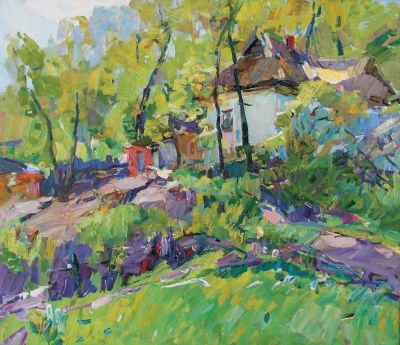 Crimea, where he lived, and the little Ukrainian village of Sedniv, close to Chernihiv, where he often traveled to paint. Taras Shevchenko, the great Ukrainian painter and poet, stayed often at the manor of Lysogub in Sedniv during the 1840s. Fyodor Zakharovich Zakharov died after a long illness in Yalta on September 29, 1994, and was buried there. 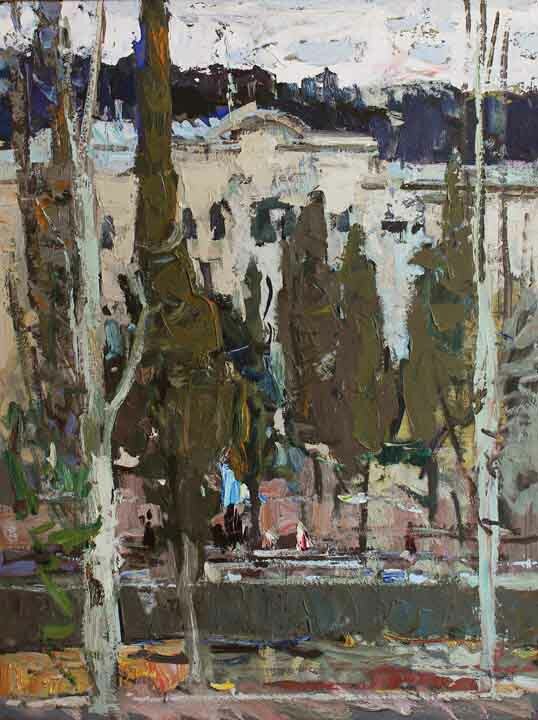 In 2016 the personal exhibition of Fedor Zakharov was opened in the Hall of Yalta's Union of Artists, Crimea. The Large catalogue of his paintings was also presented during the grand opening. Moscow 1953 / Catalogue M., 1954; Crimea, Simferopol, 1954 /Catalogue Simf., 1954; Allunion Exhibition, Moscow, 1954 /Catalogue M., 1955; Allunion Exhibition, Moscow, 1955 /Catalogue M., 1955; Simferopol, 1957, / Catalogue M., 1957; Kiev, 1957, / Catalogue K, 1957; Moscow, 1957, / Catalogue M.; Moscow 1957 / Catalogue M.; Yalta, 1958, / Catalogue K. ; Soviet Union 1958, / Catalogue K.; Leningrad, 1959, / Catalogue M.; Simferopol. 1960. / Catalogue Simf., 1960; Kiev, 1960. / Catalogue K.; Moscow 1960. / Catalogue K.; Kiev 1961, Kiev Catalogue K; Moscow 1962 / Catalogue M; Kiev, Moscow, 1964 Shevtchenko/ Catalogue K.; Crimea 1964 / Catalogue K.; Kiev, 1965 / Catalogue K.; Ukraine, 1967, / Catalogue K; Kiev, 1968 / Catalogue K.; Simferopol, 1969 Catalogue; Crimea 1970. / Catalogue; Simferopol 1970 / Catalogue; Kiev, 1971 / Catalogue; Simferopol, 1971/ Catalogue; Kiev, 1971/ Catalogue K.; Kiev1972, / Catalogue K; Moscow 1972 - 1973. / Catalogue M; Kiev 1974. / Catalogue K; Kiev1976. / Catalogue K;Kiev 1977. / Catalogue K; Kiev, 1978. / Catalogue K.,1980; Kiev / Catalogue K. 1980; Kiev1979. / Catalogue K.; Kiev, 1979 / Catalogue K.; Kiev 1980 / Catalogue K.; Kiev1980 / Catalogue K., 1981; Moscow 1981/ Catalogue K., 1981; Kiev 1983. / Catalogue K.; Kiev, 1982-1983. / Catalogue K. 1984; Kiev1984. / Catalogue K., 1986; Moscow1984. / Catalogue 1984; Kiev1985. / Catalogue K., 1986; Moscow 1985. / Catalogue M., 1985; Moscow 1986. / Catalogue M.; Kiev1987. / Catalogue K.; Munich 1997 Catalogue M.; Munich 1997 Catalogue K.; Moscow 2002, Tretjakov Gallery, Art of the 20th Century Catalogue K.; Kiev 2008, Catalogue K./ Yalta Exhibition Hall, 2016, Crimea.